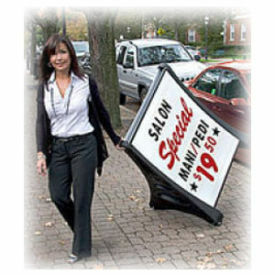 Look at these great outdoor high impact sidewalk and roadside signs that just can't be missed. Choose from our large selection of swinging, tip 'n roll, deluxe message boards and extra large signs, not to mention the signs where you can use your own graphics. Get creative with endless possibilities that grab your customers attention and bring them right into your retail store. So stop! Take a look and choose your next great attention getting sign to put in front of your store. There are 4 different types of sidewalk signs to choose from.